Day, also known as Oni Day, is an SSB4 Lucario player from Florida, considered the best Lucario player in the United States. Day is currently ranked 80th on the Panda Global Rankings 100. 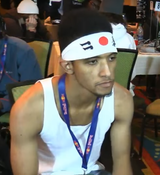 He has taken sets off of players such as ZeRo, Mew2King, 6WX, dyr, and Ryo. On January 19th, 2017, Day signed with the eSports organization G-Force as their first Smash player. CEO 2015 June 26th-28th, 2015 33rd-65th ? ? Along with Seagull Joe, Kameme, falln, Shuton, Darkshad, WaDi, and Trela, Day is one of eight players to have a tied record against ZeRo (all 1-1). On February 26th, 2017, following Tsu-'s performance at Frostbite 2017, Day announced that he'd be relinquishing access to his Twitter account to his family, until he advances to Top 8 at a major. Day is infamous for his easily noticeable cheering during large crowds, constantly known for being loud and repeatedly biased towards other players, which has been noted to be obnoxious. Due to his cheering, he had been banned from the venue at GameTyrant Expo 2017. ↑ Day announces Twitter relinquishment. This page was last edited on January 7, 2019, at 11:04.